Portadown Orangemen have refused to apply to the Parades Commission to hold their annual march on July 4. The threat of an illegal parade is understood to have raised serious concerns of potential violence by loyalists to attempt to force the parade through the nationalist Garvaghy enclave in Portadown. Serious loyalist violence took place during Drumcree disputes in the late 1990s with Orangemen orchestrating widespread disturbances. 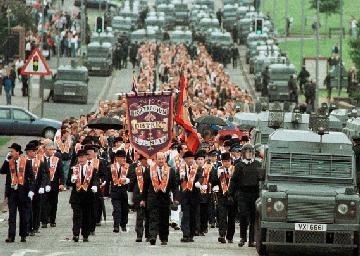 The Garvaghy Road Residents Coalition spokesman accused the Portadown Orangemen of trying to raise sectarian tensions. “It’s obvious that the Orange Order is playing a game of brinkmanship,” Mr Mac Cionnaith said. “They recognise that the current draft legislation has actually sounded the death knell for the Parades Commission and the Orange Order in Portadown is trying to take advantage of that. Sinn Fein Assembly member John O’Dowd also accused the Orange Order of raising tensions. “Most people in Portadown outside of the Orange Order see the situation at Drumcree as resolved,” he said. “Over the pest 10 years we have seen none of the violence and the people of Portadown have been able to get on with their lives. SDLP Assembly member Dolores Kelly described the development as “worrying”. “We in the SDLP had warned the British government and others at Hillsborough that they should not mess around with the Parades Commission, that as a consequence of it others would try to mess around with parades this year,” she said. An Ulster Unionist Party spokeswoman refused to criticise the order for its refusal to apply for a legal parade. “Portadown district is clearly showing its frustration at what it considers to be a lopsided approach by the authorities to some parades in Northern Ireland,” she said. The annual Tour of the North parade passed off without major incident on Friday night. In previous years serious violence erupted as the Orange Order feeder parade passed the north Belfast interface. However, because the Parades Commission had forbidden the feeder parade to pass the main Ardoyne flashpoint, the chance of trouble this year was greatly diminished. The commission ruled that to allow marchers to pass the flashpoint would have an adverse effect on “elreedy fragile community relations and potential for public disorder”. England’s World Cup match with Algeria coincided with the parade, meaning many people stayed indoors or in pubs watching the football match rather then venturing to the interface.